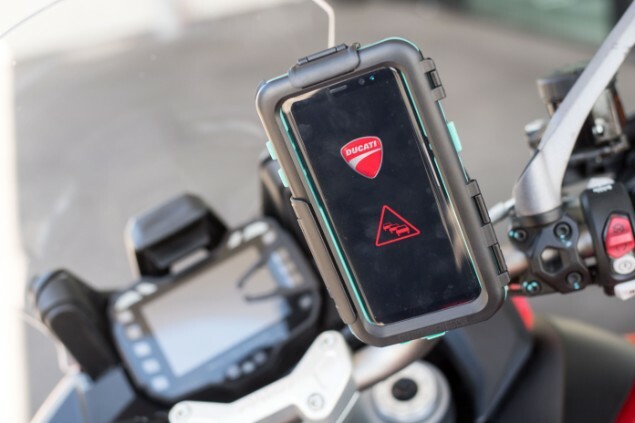 Ducati has announced it’s working on a new wireless communications safety system that will work to connect motorcycles, cars and the road infrastructure network, pedestrians and cyclists. 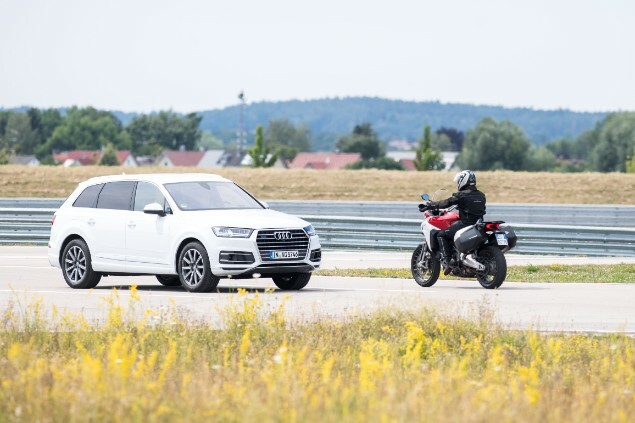 The new venture is being worked on alongside Ducati parent company Audi cars as part of Ducati’s ‘Safety Road Map 2025’ initiative. 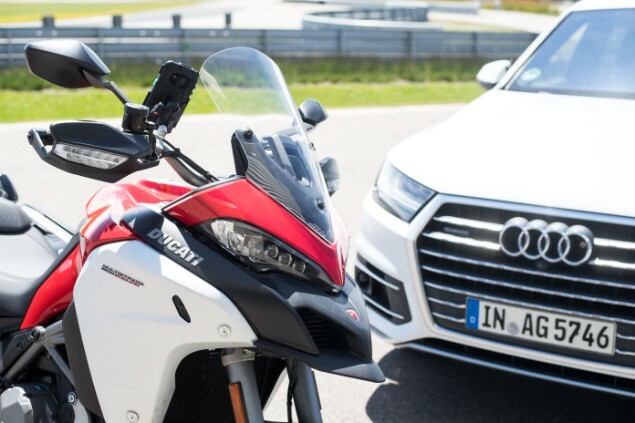 The system has been named C-V2X (which means ‘vehicle to everything communications’) and testing has been carried out using a Ducati Multistrada 1200 Enduro and Audi Q7 and A4 cars, to show how each can warn of other vehicles that are linked via a 5G network. 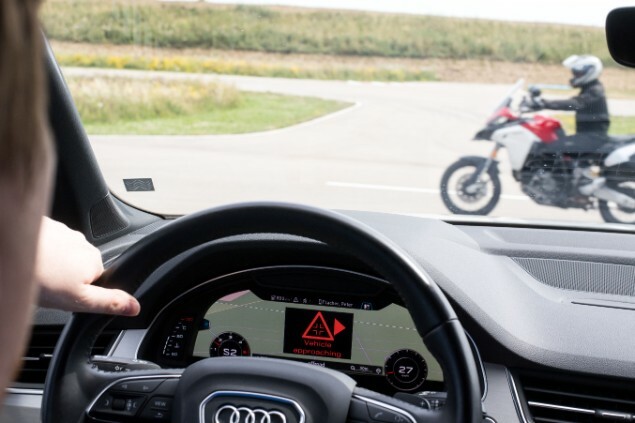 The Safety Road Map 2025 was announced by Ducati earlier this year and promises that the manufacturer will be bringing to market bikes equipped with front and rear radar in 2020. The Italian company hopes to reduce collisions by implementing existing car safety systems, which are getting smaller and cheaper as technology advances. Other first steps included widening to include the entire range of bikes the fitment of cornering ABS. 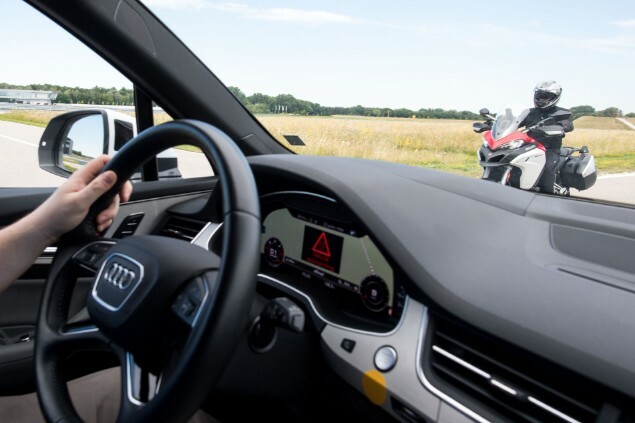 Pierluigi Zampieri, Vehicle Innovation Manager at Ducati said: “This is the perfect demonstration of use in which the modern technologies can drastically improve the safety of future motorcycle users. Ducati isn’t the only manufacturer working on this kind of connected system of communications between bikes, cars and the world around them. BMW and Honda have been working on this kind of technology for some years now. The technology is in widening use on cars but, as with most tech of this kind, the issue is with making the computer control and monitoring systems small enough to fit onto bikes. As computer power gets ever better and ever smaller, this is now happening and the next five to 10 years are going to see big changes to motorcycle and the safety systems they can put into use. The Ducati demonstration showed various elements of how the technology works. These include Intersection Collision Warning, where a vehicle equipped with C-V2X technology pulls out from a junction of an adjoining road and avoids hitting a motorcycle rider who has the right of way, as well as Across Traffic Turn Collision Risk Warning, in which a vehicle avoids a left turn collision with a motorcycle.